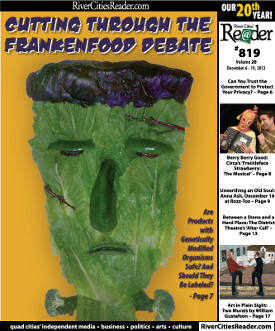 Cutting Through the Frankenfood Debate: Are Products with Genetically Modified Organisms Safe? And Should They Be Labeled? Two events in the past few months raised the profile of foods with genetically modified ingredients - and also put a spotlight on how messy the issue can be. The first was the publication in September of a study led by Gilles Eric Séralini involving the herbicide Roundup and herbicide-resistant Roundup Ready corn (technically known as NK603) - both Monsanto products. Rats in the study developed tumors, died prematurely, and suffered organ damage. The second was the defeat in November of California Proposition 37, whose ballot summary read that it would have required the "labeling of food sold to consumers made from plants or animals with genetic material changed in specified ways." There was a lot of heat with both events. The Séralini study and its PR roll-out were met with an intense backlash from genetic-engineering apologists and much of the scientific community, and the European Food Safety Authority - among other scientific organizations - rejected its validity, saying it featured "inadequate design, analysis, and reporting." In California, Prop 37 opponents - including Monsanto Company, E.I. DuPont de Nemours & Company, and the Grocery Manufacturers Association - spent more than $40 million to defeat the labeling ballot measure. Yet combined and detached from the rhetoric and motivations on all sides, these two events neatly summarized the national and international debate over foods with genetically modified ingredients. Are they safe for human consumption? And should the government require the labeling of foods with genetically modified ingredients - the way nutrition and ingredient labels now note the presence of allergens? Depending on whom you ask, the answer to the first question ranges from "absolutely" to "we don't know" to "absolutely not." And the answer to the second question is largely - but not wholly - determined by the answer to the first. In addition to California's failed proposition (which lost 52 percent to 48), efforts are underway nationally and in many states to mandate the labeling of food with genetically modified ingredients. More than four dozen countries presently require these labels, but the United States does not. The Just Label It (JustLabelIt.org) campaign says more than 1.1 million people signed its petition to the Food & Drug Administration (FDA) asking the agency to label foods with genetically modified ingredients. "We really believe this is an honesty, transparency, and good-business practice that we really need to shed light on what's in America's food," said Executive Director David Bancroft. In Iowa and Illinois, Food & Water Watch is pushing for state action on labeling. It's a complicated, nuanced issue with safety, cost, environmental, regulatory, political, ethical, and scientific elements, and that's exacerbated by the spin and noise on all sides. Still, focusing on those two core questions of safety and labeling can cut through a lot of that. You'll see a lot of different terms describing the same thing as it relates to food: GE (genetically engineered), GM (genetically modified), GMO (genetically modified organisms), and biotech. You've also probably come across the vivid and derisive "Frankenfoods." With all of these, we're talking about the insertion into one organism of a gene from another organism. If the species are not related, this is called "transgenesis"; if the species are closely related, it's called "cisgenesis" or "intragenesis." To give an extreme example of this concept, transgenesis has been used to create goats with a spider gene that makes them produce milk with spider-silk proteins. While transgenesis and cisgenesis are clearly different from traditional agricultural "selective breeding" - for example, the breeding of two corn varieties to produce a third - their goals are the same: to create a new product that is in some way superior to what was previously available. In 1994, the Flavr Savr tomato became the first GMO approved for marketing in the United States. This variety delayed ripening, which meant that it would stay fresher longer. In theory, genetic engineering can be used to create all sorts of favorable food characteristics - from greater shelf life to higher yields to improved nutritional content. In a food context, genetic engineering has produced golden rice, which through the addition of genes from a daffodil and a bacterium increased levels of beta-carotene; the product was developed to combat Vitamin A deficiency - an example of how genetic engineering might be used to address global food and nutrition needs. But the most common deployment of GE crops is in the battle against weeds and insects. Roundup Ready crops from Monsanto, for example, are resistant to the company's Roundup herbicide. And many crops have been engineered to produce their own insecticide - Bt derived from the bacterium Bacillus thuringiensis. So the question of food safety must also consider the health effects of the chemicals used to protect some GE crops and the pesticides produced by others. According to the International Service for the Acquisition of Agri-Biotech Applications, in 2011 the United States dedicated more than 170-million acres to biotech crops - tops in the world - including corn, soybean, cotton, canola, sugar beet, alfalfa, papaya, and squash. Worldwide, it said, herbicide resistance is the most common biotech trait, present in 59 percent of nearly 400-million GE acres. Crops with multiple biotech traits covered 26 percent, and insect resistance covered 15 percent. The organization said that 29 countries have planted commercialized biotech products, and another 31 countries allow biotech crops to be imported for food and animal-feed use. Genetically engineered varieties of 25 crops - from corn to potatoes to tobacco to roses - have been approved by national governments for commercial cultivation or use as food or feed. Widely cited figures suggest that GMOs are present in the ingredients of between 60 and 80 percent of foods in United States grocery stores - although those numbers are almost certainly rough estimates and largely meaningless without more details and definitions. But it's safe to say that because of the prevalence of corn, soy, vegetable-oil, and sugar inputs in processed food, you'd be hard-pressed to avoid them without some sort of GMO labeling - whether a positive statement of their presence or a negative statement of their absence. To return to the first question of food safety, it would be accurate to say that at this point, there's no evidence widely accepted by the scientific community that GMOs currently used in food products present health risks to humans who consume them. As Martina Newell-McGloughlin, the director of the University of California's Biotechnology Research & Education Program, said in response to the Séralini research: "Despite numerous studies in the peer-reviewed scientific literature, and substantial experience with humans and animals around the world consuming biotech crops for over 15 years, there has not been a single substantiated case of negative outcomes or a single documented health problem." That might sound reassuring, and many people in the scientific community and biotech industry go even further, saying not only that there have there been no proved negative health effects, but that GMO food is unequivocally safe. In a Scientific American blog post last year, Pamela Ronald - a plant-pathology professor at the University of California, Davis - repeated a common refrain: "There is broad scientific consensus that genetically engineered crops currently on the market are safe to eat." The biotech industry in addition states that GE crops have been rigorously studied for safety - at least compared to selective breeding. "It's the most-studied plant-breeding technology that we've ever done," said Thomas P. Redick, a St. Louis attorney who serves as counsel to the American Soybean Association and who co-wrote the 2010 book Thwarting Consumer Choice: The Laws & Flaws of GM Labeling (which was published by the American Enterprise Institute). "Nobody has shown me anything - and I'm looking - by way of an allergy or a toxicity that you could document even under give-it-the-benefit-of-a-doubt science." But many people add a major caveat to those claims: GMOs used for food in the United States are not required to have human clinical trials, tests for carcinogenicity or harm to fetuses, long-term testing for human health risks, or long-term testing on animals. Typically, GMOs undergo 90-day feeding trials with rats to establish that they don't carry risks to human health. In other words, it would also be accurate to say that at this point, the testing of GMOs has been inadequate to allay the health concerns that many people have about them. And it might further be true that no amount of scientific research will make people fully comfortable with the idea of eating transgenic food. This is why the Séralini research caused such a stir: Unlike most tests on GMOs used for food, it considered health effects over the full two-year lifetime of its tested rats. "What he found was by no means definitive, but he found liver abnormalities, kidney abnormalities, he found tumors ... ," Just Label It's Bancroft said. The methodology and sample size of the study have been savaged in many scientific circles, but anti-GM and pro-labeling groups have seized upon the conclusions as a red flag: Given how few long-term studies have been done on the health effects of GM crops, shouldn't this finding merit more study and trigger some regulatory precaution? In Mother Jones, Tom Philpott acknowledged the problems with the Séralini study but concluded that "it provides a disturbing hint that all might not be right with our food - and shows beyond a doubt that further study is needed." He added that proper studies "would require a serious commitment of resources," and the situation "reminded me of just how little funding GMO safety studies get here in the United States, the global capital of GMO production and consumption." The European Network of Scientists for Social & Environmental Responsibility echoed this point: "The controversy and vitriolic attacks evoked by the study reveal one underlying aspect: The lack of appropriate and agreed methodologies for long-term studies to scientifically assess the effects of lifetime consumption of GM foods." To understand this situation, it's useful to look at how the Food & Drug Administration views GMOs. In 1992, the agency established a "guidance" on "foods derived from new plant varieties." The basic idea is that "foods, such as fruits, vegetables, grains, and their byproducts, derived from plant varieties developed by the new methods of genetic modification are regulated within the existing framework ... identical in principle to that applied to foods developed by traditional plant breeding. The regulatory status of a food, irrespective of the method by which it is developed, is dependent upon objective characteristics of the food and the intended use of the food (or its components). ... [T]he key factors in reviewing safety concerns should be the characteristics of the food product, rather than the fact that the new methods are used." Changes to "objective characteristics" that might trigger additional regulation include "known toxicants," changed nutrient content, and "allergenicity," the document states. This is known as the "substantial equivalence" approach: In the absence of some significant compositional difference in the food product compared to a similar one developed through conventional breeding, the GMOs will be regulated in the same manner. Most GMOs for food, then, are not subject to any more stringent federal regulation than non-GMOs. "'We don't need testing.' ... That's what's being claimed in the substantial-equivalence argument," said Moline chiropractor and nutritionist Dr. Curtis L. Rexroth at a November 14 Food & Water Watch event in Davenport. (Video can be found at RCReader.com/y/fww.) "So no testing, except volunteer testing by the seed companies ... who hope to and do profit from this process. All we want basically is the tests; we want more science." "There is a very small amount [of health research], and it's very short-term," Bancroft said. "There are very few independent long-term studies. ... If you put an insecticide inside of a drug, it would take you five to 10 years to get it approved. If you put an insecticide within a food, in less than a year or so you can have it out on the market being consumed by Americans. We need to treat our food introductions just like we treat our drug introductions and make sure that we have science on our side." He also said there's a double standard at work. Séralini was criticized for his sample size and the tumor-prone breed of rat he used, but these were "the exact same rats [Sprague-Dawley], the exact same sample size that the patent-holder submitted in the original data," he said. "So if you don't like the scientific methodology of the Séralini study, you probably don't like the scientific methodology under which the original crop was approved." This hits on the intuitive argument for labeling: the precautionary principle that we should label products whose long-term health effects haven't been extensively studied. Bancroft said his organization is pro-labeling rather than anti-GE, and he did not say that GMOs in food have negative impacts on human health. "I would say we're totally in the 'we don't know' arena," he said. He added that biotech companies are "having it both ways": "We have these companies, these patent-holders, that will go into Washington, go into a patent office, and they will say, 'Hey. I have this brand-new genetically modified organism, and this is how we created it, and this is how it is substantially different from everything else out there. Please give me a patent.' And then they walk down to the other side of Washington, DC, the FDA, and they say, 'Look, we've got this genetically modified organism, and it's the same as everything else.'" Control of patented intellectual property is at the heart of why many people are skeptical about the safety of biotech foods: The companies that hold the patents dictate research. "We basically feel that there haven't been enough studies done - haven't been enough long-term studies done," said LeeAnn Felder, the outgoing Quad Cities field organizer for Food & Water Watch. "And that's partly because of the seed patents that limit scientific research on these foods, and the fact that much of the research that has been done has been by the companies that sell these foods." "If you don't have access to the materials, it's very difficult to do the research," Bancroft said. "Access to the seeds is controlled by the patent-holder." So lacking thorough government-mandated long-term testing, many people are calling for label requirements for food with GMOs. "If the government won't do the studies and assure these foods are safe, should not every American have the right to decide for themselves?" Bancroft asked. "Ninety-one percent of the American population says that they want labeling," he added. "We already have labeling for orange juice from concentrate. We have labeling on irradiated foods. And those have come about primarily because that's what the public wants." And beyond food safety, he said, people want to know about GMOs in their food for environmental and religious reasons: "There's a stronger need for a governmental role here to have labeling across the board." But consumer preference isn't enough for FDA action, American Soybean Association attorney Redick said, and neither is a consumer perception that food without GMO ingredients is safer. The agency's primary charge is to protect health, and to invoke the authority to label GMO ingredients (without congressional action), the FDA would need to establish risks to human health, he said: "If they tried to write something that didn't have any safety basis ... the question really is whether there's a material difference that is scientifically posing a health-and-safety type of risk." If there were a documented risk to human health presented by a GMO ingredient, he added, the FDA would have the authority to further regulate that ingredient - including adding a warning specific to that ingredient on food labels. But to require a general label for all products containing GMOs would be meaningless, Redick said, akin to having an allergen warning that doesn't specify which allergens are or might be present. "A generic 'Hey, GMO might be here' doesn't tell the consumer anything at all that helps improve their ability to manage their own health risks," he said. Here it's worth noting that a GMO label could take any of several forms - and not just the blanket one Redick attacked. Bancroft said his organization doesn't have a position on the prominence or wording of labels, but they might be as subtle as noting, for instance, the specific type of GE corn instead of just "corn" on the ingredient list. "I don't think it needs to be stamped in bold letters on the front of the package," he said. "It just needs to be there so consumers can find it and be aware of it. ... It would definitely be a step forward. We have gotten resistance to just the entire idea of labeling." But many of these - aside from the core claim of the safety of GMO food ingredients - result from the logistics and details of implementation, rather than the concept of labeling itself. Yet despite the labeling experience of dozens of countries, Redick refused to say whether labeling actually increases prices at the consumer level: "The studies show that there are huge impacts, but mainly on growers. Whether the food companies then added price to their products or just absorbed the cost is an open question. That's a hard study to do." Many of Redick's arguments dealt with California's Prop 37, and the specifics of the ballot measure served to muddy the waters of the basic question about the wisdom of government-mandated labeling. So, too, will Food & Water Watch's "Let Me Decide" efforts in Illinois, Iowa, and Florida - which raise the legal question of federal versus state authority and, if successful, could result in litigation by both the FDA and the food industry. Felder said her organization is working with state Senator Joe Bolkcom to introduce labeling legislation in Iowa next year. Food & Water Watch is also conducting a postcard campaign to Senator Joe Seng of Davenport, who chairs his chamber's agriculture committee. She said she doesn't have a time frame for passage, but "it could take multiple years, and that's why we are trying to lay the groundwork here to get the word out and to get some legislators on board." Asked why the group is working with state legislators rather than focusing on the federal government, Felder said: "To create a powerful movement, to really get the word out about this issue, we need to be working at both levels." Just Label It's Bancroft admitted that state efforts aren't, practically speaking, an ideal vehicle, but they're useful for raising public awareness: "Bottom line: Labeling is a national issue that needs a national solution. But we're not quite there yet, and anything and everything that calls attention to this issue and educates the public is good." Still, the campaigns to implement labeling at the state or federal level miss one important fact: We already have vehicles for labeling food without GMO ingredients. Redick compared the labeling of GMO food to a government requirement to label non-halal meat or non-kosher products. In all three cases, voluntary, certified labels already exist for people who want to find something - halal, kosher, or non-GMO - and it's not necessary for the government to force the labeling of things that don't meet those criteria. More reliable are foods with the Non-GMO Project label (NonGMOProject.org), which has been endorsed by the grocery chain Whole Foods. The project has a 0.9-percent GMO tolerance, and products are verified; "ongoing testing is required for all GMO risk ingredients," its Web site states. But Davenport's Greatest Grains is the only participating Quad Cities-area Non-GMO Project retailer, meaning that local consumers don't have many options. The level of grocer participation seems at odds with the oft-cited levels of public demand for GMO labeling, and until voluntary efforts such as the Non-GMO Project take off with both retailers and consumers, the government-labeling approach will appeal to many. Furthermore, Non-GMO Project-labeled products, like certified organic foods, will likely be more expensive, Felder said. "We see it as a social-justice issue," she said. "You shouldn't need to spend more money to know for sure if you're consuming genetically engineered foods. All foods should be labeled." Ultimately, the labeling question is or should be secondary to the safety question. Bancroft admitted that the labeling movement is a response to what he sees as an inadequate regulatory system : "We need to have a 21st Century review of the science of GE foods that cuts across all agencies - the patent office, EPA, USDA, FDA. We need a top-to-bottom review of how government regulates these foods."